are triangular or cone-shaped ritual offerings usually sculpted from barley flour dough and painted or embellished with applied decoration. Usually, they are kept on a shine or altar as an offering on special days to a deity or to represent a deity. torma, a form that is considered to be particularly powerful and belongs to the Nyingma tradition or school. 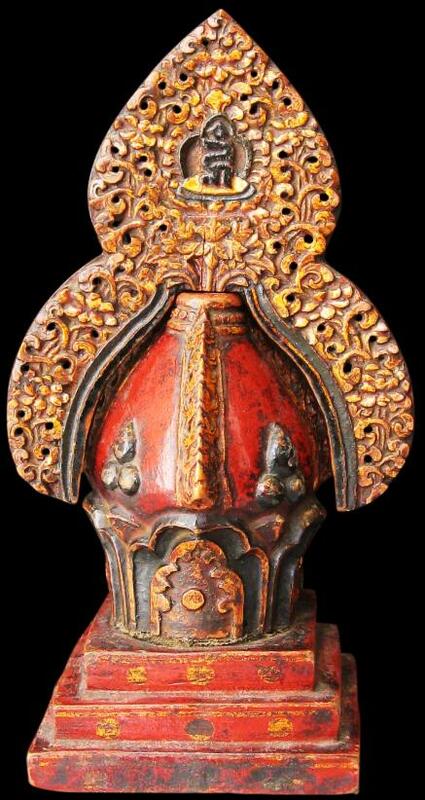 Traditionally, it was placed at the centre of the shrine but also could be used as a blessing item and could be placed in a respectful position anywhere on the shrine or about one’s dwelling. kalachakra motif which provides the three syllables Om Ah Hom in Lantsa script. These represent the body, speech and mind of the Buddhas.Tormas vary in complexity from a simple cone painted white to represent peaceful deities like Tara and Avalokiteshvara, to more complex designs for semi-wrathful deities like Vajrayogini and Chakrasamvara. This example appears to be of the latter variety, with its intricate carving and use of flame motifs. This example has a wonderful patina and colour; its considerable age being clearly evident. Tse Bartholomew, T., & J. Johnston (eds), The Dragon’s Gift: The Sacred Arts of Bhutan, Honolulu Academy of Arts, 2008.